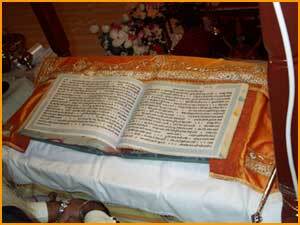 The Sri - Gur Granth Sahib is the Holy Book for Sikhs, as Guru Gobind Singh teached us. Guru ji, said the holy book will be the Guru after him, no other human form Guru will come. The 11th Sikh Guru Granth Sahib is the everlasting Guru. The Holy book contains writings of the Sikh Gurus, Muslim Fakirs and Hindu saints. A collection of prayers (Shabads) written by the Gurus which we recite to music. The first copy of the holy book was installed in the Harmandir in 1604 (Golden Temple). The fifth Guru, Guru Arjan Dev deciphered the book. It was written by his uncle, Bhai Gurdas and it was printed in Punjabi. There are a total of 1,430 pages consisting of 5,894 hymns which are shabads. Each shabad have a special tune called a raga. Guru Nanak composed some scriptures and other gurus helped. The second edition was completed in 1706 by the ninth Guru Gobind Singh. The holy book is kept inside all Gurdwaras and the centre piece is the Takht, means a throne. The book is placed on raised platform with a decorated canopy above it. Every morning the book is taken out from the special rest room and carried on th e head to the centre of the room and is put on the throne. The devotees bow to the holy book, when they enter the Gurdwara. Chauri -The priest waves this over the Holy book, when he reads Sikh scriptures.